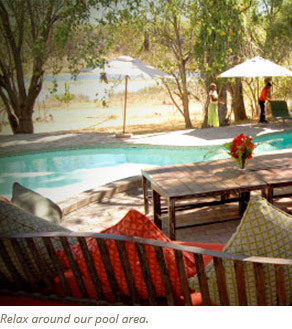 Audi Camp is situated 12km from Maun on the road into the Moremi Game Reserve. We’ve been here for 20 years – we are a stop over for self-drives, a starting point for great adventures, a respite from the bush and a good place to hang-out, relax, drink, eat and be-merry for Maun people. In addition to being a great place to stay – the very friendly team at Audi camp (that’s us!) also offer reasonably priced mobile safaris to all the best places in the Moremi, Central Kalahari, and the Pans and have been doing so for decades – so we know our stuff. If you want to experience the delta as it should be seen then why not take a Mokoro safari with an expert local poler? If you’d like to make a booking for a safari or accommodation then please contact us. Audi Camp has changed a lot over the past two decades and we’re looking pretty fancy these days. 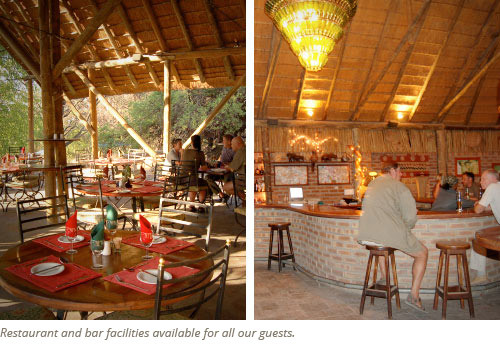 We have a great bar – the perfect place for re hydrating after a bush adventure or simply celebrating life. You can also buy drinks from here to take on safari. Our restaurant has an extensive and very popular menu – we love the tarragon chicken and the Tex Mex burger but there’s loads to choose from. We have a great pool which is very popular with guest after a long, hot, dusty drive. Following a refreshing dip try lying in the shade with a cool beer – guaranteed to restore your sense of humour! We offer camping sites with and without power points for those who like to do it themselves. There are large shower/toilet blocks and, of course, if you don’t feel like cooking you can always cheat and use the restaurant! For those who want things a bit easier we have pre-erected dome tents with comfy stretcher beds. Want it a bit easier still? How about a mini-meru with proper beds...or if you’re really intent on taking things easy spend a night or two in our luxury en-suite tents or our house. Restaurant and bar opening hours: 7am-10pm. We have shaded camping areas some of which have power points. We have security at night and there are open air showers with hot water and toilets as well as areas for washing clothes / dishes etc. We can also arrange transfers from town. We have a number of large pre-erected dome tents with mattresses and stretcher beds. 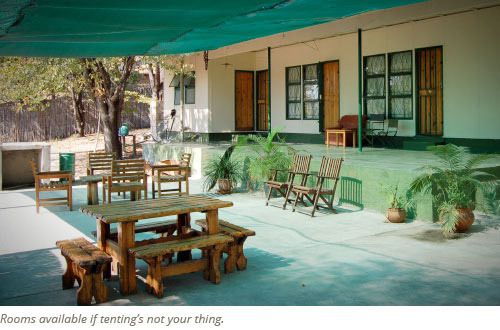 These tents are not en suite but there is a large ablution block with open air showers and hot water. Rates for dome tents: P220 double, P180 single. Special rates for South Africans: P180 double, P145 single. We have a number of mini meru tents with beds, electricity and a fan. All linen is provided. 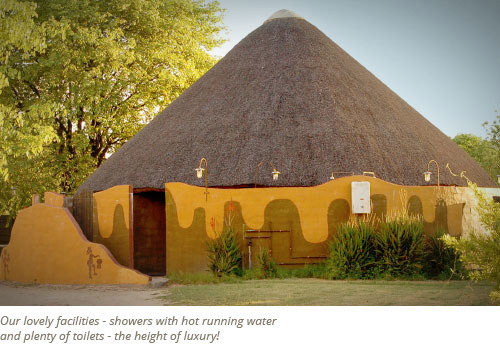 These tents are not en suite but there is a large ablution block with open air showers and hot water. Rates for bedded tents with breakfast: P530 double, P390 single. Special rates for South African with breakfast: P430 double, P310 single. We have recently added some en-suite tents to our main camping area. These tent have two single beds. Rates for en suite tents with breakfast: P630 double, P490 single. Special rates for South Africans with breakfast: P570 double, P440 single. 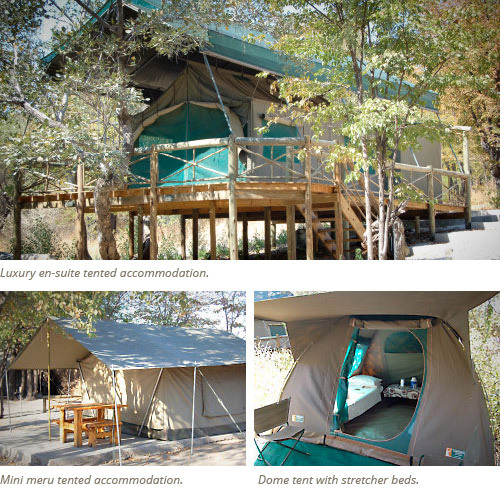 We have luxury en-suite tents on raised wooden decking over looking the river. These large meru-tents have comfy beds, electric lights, large en-suite bathrooms and their own fire places and cooking area. Rates for en suite tents with breakfast: P795 double, P660 single. Special rates for South Africans with breakfast: P645 double, P530 single. Self-catering house sleeping 10 with kitchen, shower, bath and toilet. Can be hired as a whole or by the room. Ablutions are shared between the house occupants. Already been on one of our safaris? Rate our accommodation on tripadvisor.